Border Collie Dogs - The Border Collie is a hard working breed of herding dog that originated in the border country of England and Scotland. They are regarded by many as the most intelligent dog breed. Border Collies are highly energetic, and as a result have a tendency towards neurotic or destructive behavior if not given enough to do mentally and/or physically. They are still frequently used on farms all over the world for assisting with the handling of livestock, although they have also become popular as pet and sport dogs. 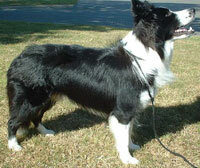 Border Collies have historically been selected for working ability, not looks, and therefore vary widely in appearance. This information is licensed under the GNU Free Documentation License. It uses material from the Border Collie article on Wikipedia.org. Border Collie Breeders - Advertise your kennel puppies and dogs here. Box C Stables - Ohio - We here at Box C Stables are proud of our Border Collies. They are smart and energetic. Located in Southern, Ohio, we have been raising Border Collies for about 12 years. The bloodlines we have chosen have not had any genetic difficulties. Many pups have been used as pets, but some are working and playing hard as: 4-H projects, agility and working sheep, cattle and horses.